I'll be the first to admit that some methods for earning a little extra cash on the side can be very boring and sometimes I like to do something a little more engaging. 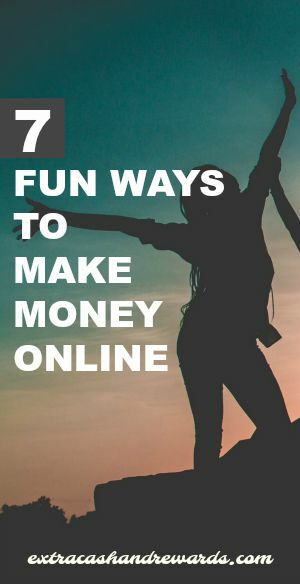 Here's a list of a few interesting and fun ways to make money online that you can get started with today. There are lots of sites out there that will pay you a little bit of extra change or redeemable points for just sitting at your computer or using your smartphone to watch videos. Most of the time, these are just short 1-2 minute clips. The amount of videos you have available to watch will vary from day to day and from site to site. Below are a few of my favorite sites that pay you to watch videos. If the idea of earning cash to watch videos appeals to you, then check out SwagbucksTV! You can watch videos from the mobile app and website to earn points which can be redeemed for many different types of gift cards or you can have funds sent straight to your Paypal account. The videos are often trailers for movies and TV shows as well as various other types of video clips. Read our Swagbucks review to learn more or go here to sign up. While Perk offers several different ways of amassing redeemable points, the best way is by watching videos through the mobile app, which is available for many different devices. The big perk to Perk (pun intended) is that the videos play in a loop so you don't have to select a new one every few minutes and you get credited for every video that plays. Redeem your points for gift cards or Paypal cash once you have met the threshold for cashing out. Read our Perk review to learn more or go here to sign up for Perk. Believe it or not, there are many music artists out there who need opinions on the new stuff they are putting out. So much so, in fact, they are willing to pay a little bit to people who are open to rating and reviewing their clips. Slicethepie is a place you can go to listen to some great music, give new artists important feedback and make a little money all at the same time. All you have to do is listen to a song, give your honest opinion about all the various aspects of what you heard like the quality of the music and lyrics, and you earn cash every time you do it. The more high quality reviews you write, the more you can earn. Read our Slicethepie review to learn more or go here to sign up. Music XRay is another fun music reviewing site like Slicethepie but there's one big difference. While it's possible to review many songs in a day on Slicethepie, you have to wait until you are emailed an invitation to review music at Music XRay. That doesn't mean it's not worth checking out though. If you enjoy music you might as well sign up for both! Read our Music XRay review to learn more or go here to sign up. I don't know about you, but I find it very easy to lose track of time while playing mindless little online games. It's quite fun, but you may feel guilty for wasting time. Fortunately, it doesn't really count as “wasted time” if you earned a little for playing. The sites below will pay you in redeemable points for spending time on their sites, playing online games. I've already mentioned Swagbucks TV as a way to earn some money while having fun but that's not the only option available. Swagbucks also offers a lot of different ways to accumulate redeemable points including games. MyPoints is another rewards site where you can collect redeemable points for doing different activities like shopping, filling out surveys and so on. If you're looking for something FUN to do there, check out their list of games. Read our MyPoints review to learn more or go here to sign up. GrabPoints is a lot like Swagbucks. You can watch videos, take surveys, accept offers, play games and more. You're rewarded with points redeemable for gift cards and Paypal cash. Go here to sign up for GrabPoints. So that wraps up our little list! If a lot of the extra cash options out there are boring to you, hopefully you'll find more fun ways to make money on this list to keep you busy and earning extra for a long time. For more ideas on how to make extra money on the side, check out this list of my 16 favorite side earners. This post originally published on January 16, 2015. Updated and republished on April 2, 2019. Slicethepie is one of the websites where you can earn relatively a lot if you know what to do and do it well. It’s a pretty easy and interesting job. Moreover, there are always enough songs to listen to. On the MusicXray songs appear once in a while, however, it’s way easier to earn there.